Load capacities shown throughout the catalog are to be used as guidlelines and may differ depending on the application and type of performance desired. Trew capacities are based on intermittent use at speeds not greater than 3 mph. With treaded wheels, increasing the speed and/or duty cycle reduces the capacity. Many other factors can negatively influence the life of a wheel, such as obstacles, bearing lubrication and environmental conditions. Greater capacity (or other special requirements) can be achieved by modifying the tread type, hardness or thickness. Consult the factory for further information. Wheels are made from nearly indestructible forged steel and as such are limited in capacity only by the type and size of the bearing used. Our most versatile wheel is generally limited in capacity by the tread. Harder treads for higher capacities are available. Rubber treads are great for cushioning and quiet operation even on rough floors. However, rubber treads restrict capacity. Harder treads for higher capacity are available. Heavily sectioned Class 30 iron designed to withstand heavy loads, and is capable of severe duty. However, cast iron is unsuitable for high impact/shock applications. Drive wheel applications may have severe duty cycles and torque requirements which negatively affect the capacity of the wheel. Consult the factory for capacities per application. Choosing the type of wheel that best suits your application is an important requirement. Each wheel type may have characteristics that make it excellent for one job but unworkable for another. This chart provides general information you may find useful in choosing a wheel. If further guidance is required, please consult the factory. Type of bearings can have a major impact on reliability, durability, maintenance schedules, and capacity. See "Wheel Components" for further bearing information. Floor conditions: The presence of obstacles, debris, oil and/or chemicals can have a significant impact on the life and performance of a wheel. A general rule is that softer treads are better for obstacle laden floors, floor protection and quiet operation. 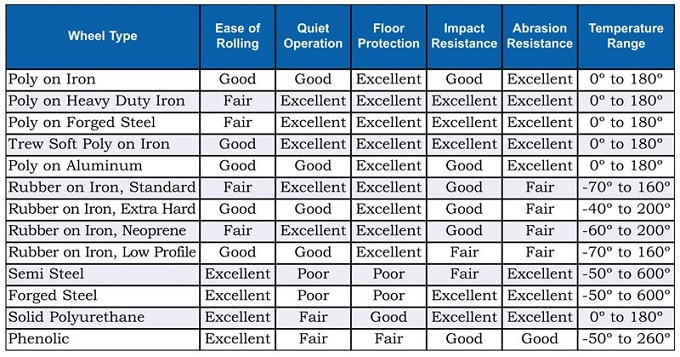 Harder treads are best for reliability on smooth floors but offer less floor protection and cushioning. Maintenance: The expectation that wheels will or will not be properly maintained is another factor in choosing wheels/bearings. Manual vs Power Tow: Generally, power tow requires durability and quiet operation, whereas manual operation requires reliability and ease of swiveling. Properly matching wheels to specific applications can involve factors too numerous to list completely. Please consult the factory for further information.